Clearly, Mazda doesn't think that a pick-up has to look like a delivery mofo. Its macho-looking Mazda BT-50 Sports Series guarantees that it isn't just a truck you'd use to transport whatever it is you want to transport. We wouldn't be terribly suprised this Mazda picks you up some much needed good luck with the girls, too. The front of the Mazda BT-50 looks fierce. Coupled with Mazda's signature grille, the BT-50's front bumper and fitted over-rider make the pick-up look like one mean customer. Its fog lamps and rear lamp bezel have been given a facelift, as well, balancing out its strong stance nicely. All this makeover gives the BT-50 that extra oomph. 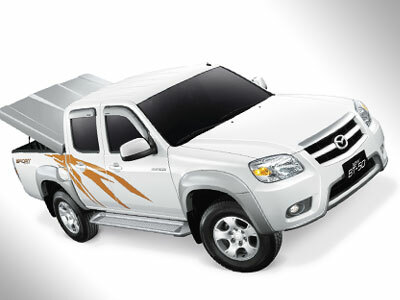 In terms of performance, the Mazda BT-50 gives you a lot to hoot about. A power-packed 2.5-liter engine that produces 143 horsepower and 330Nm of torque ensure a steady ride, even in the bumpiest part of Edsa. A better feature is the BT-50's nature-friendliness. Its engine has been fine-turned to efficiently burn fuels composed of as much as 5% biodiesel.